Prominent & Leading 100% Export Oriented Unit from Jaipur, we offer precious style 925 silver 7 stones chakra pendant, wings design 925 sterling silver chakra pendant, personable 925 sterling silver multi stones chakra pendant and fantabulous design 925 sterling silver pendant. Precious Style!! 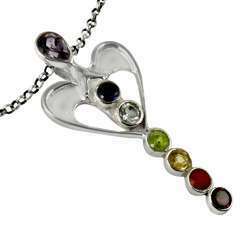 925 Silver 7 Stones Chakra Pendant Amazing Amethyst, Garnet, Iolite, Carnelian, Blue Topaz, Peridot, Citrine gemstone 925 sterling silver chakra pendant at wholesale price. Wings Design ! 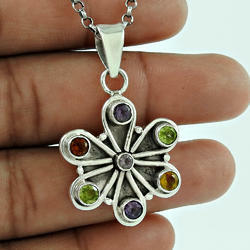 925 Sterling Silver Colorful Stones Chakra Pendant Circle of Hope Amethyst, Iolite, Blue Topaz, Peridot, Citrine, Carnelian, Garnet gemstone 925 sterling silver chakra pendant at wholesale price. Personable!! 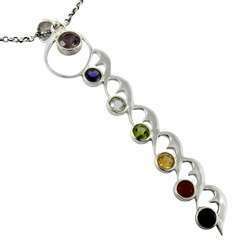 925 Sterling Silver Multi Stones Chakra Pendant Beloved Amethyst, Garnet, Iolite, Carnelian, Blue Topaz, Peridot, Citrine gemstone 925 sterling silver chakra pendant at wholesale price. Fantabulous Design 925 Sterling Silver Pendant Jewelry Beautiful multi gemstone 925 sterling silver earrings at wholesale price.